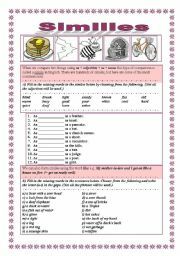 Worksheet to practise prepositions after adjectives and verbs. Key included. 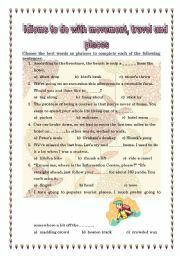 This worksheet is a cloze text. 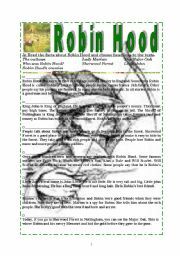 Students are supposed to fill in words in the text, the alternatives are given in the box on page two. A key is added on the third page. I hope you will find the exercise useful. Enjoy! 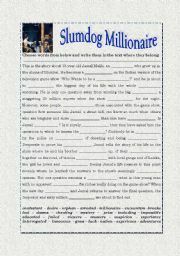 This two-pages worksheet deals with similes/idioms like IT FITS LIKE A GLOVE and WHITE AS A SHEET. Explanations and exercises. Key included. Get your students talking. 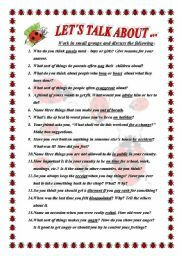 I prepared this worksheet for my students at intermediate level to practise speaking before their oral exam. They discuss the topics in small groups. 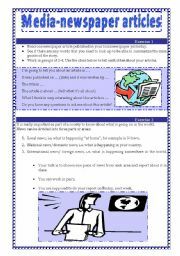 Worksheet with reading tasks, 2 pages: Matching the headings with the paragraphs, answering questions and vocabulary practise, i.e. matching words with definitions. Key is included on page 3. 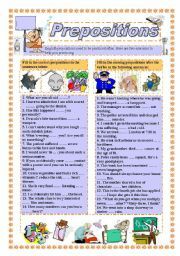 Worksheet to practice prepositions. Ss are to fill in the gaps in the sentences with a suitable verb + preposition (to choose from the box below).Key is included. 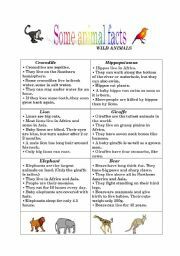 Doing this exercise pupils can read and learn facts about wild animals. They can also look up and learn words they don�t know already. 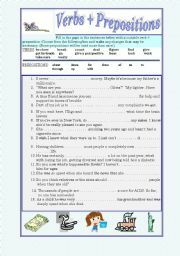 Worksheet to practise vocabulay related to characteristics and feelings. At the same time pupils practise reading omprehension.The key is included on the second page.